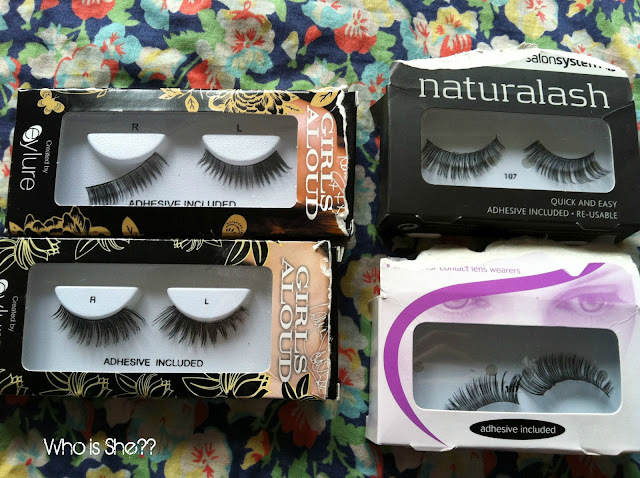 I’ve never really seen many posts on people’s blogs about false eyelashes, so I thought today I would share with you my false eyelash collection. I never thought I actually owned that many pairs of false eyelashes until I had a mini clear out recently. I think it’s probably due to the fact that every time I go to Boots or Superdrug and I see them on offer I normally pick up a pair and lo and behold they soon add up. 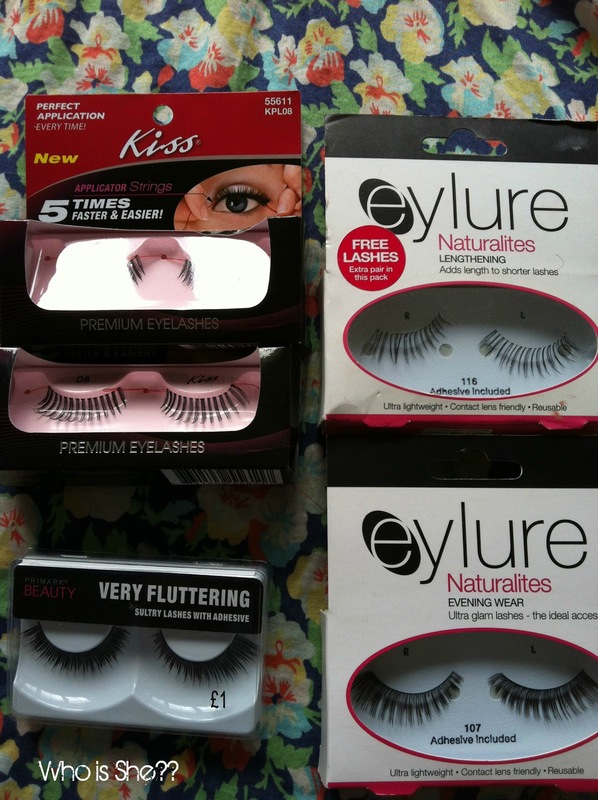 Kiss Eyelashes x2 (currently 79p in Home Bargains), Eylure 115 (double pack). Primark Very Fluttering, Eylure 107. Eylure Girls Aloud Kimberly (top) and Sarah (below), Sally's Naturalash in 107 and Eylure 107. Here's a tip Drew Ashlyn told me at the Illamasqua store opening- double up your lashes in the corners with what you have trimmed off for a dramatic effect on a night out (hence the loose pieces in the box). I can't put false lashes on, no matter how hard I try/follow YT videos etc- they will not work. I never wear them for nights out, only once in a blue moon if Steph or JEM puts them on for me. Its basically a glorifed waste of my money. If anyone has any tips or links to videos on youtube, please let me know. * I recieved the Illamasqua 17 lashes in a goodybag at an event, and the number 21 lashes were bought with 15% discount at the same event. Loads easier than using tweezers! ive only just got into wearing them and now i cant live with out them! I absolutely LOVE false eyelashes!! I always wear them for nights out. I put them on using my fingers as close to my natural eyelashes as possible, then squeeze the base of the false eyelashes and my eyelashes together, works everytime! :) Also, when I'm putting them on I apply it to the outside of my eyelashes first and then work along my eye going inwards towards my nose. Oh and the eyelashes with thinner strips are better than the ones with thicker strips.Hope that helps and makes sense lovely!! I say practice practice...I couldn't put them on before either, it was a mess...but now it's fairly easy, I wear them all the time.